Envelope, please. Drum roll, please! And, the winner is … Brigitte and Mike Meehan of Elgin, Illinois! 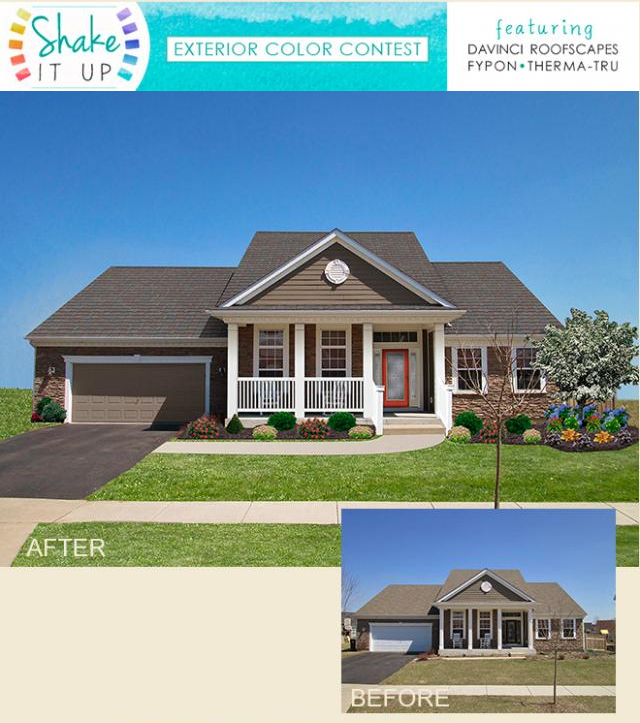 The Meehans have won the online public voting and will receive the $5,000 cash grand prize in the DaVinci Roofscapes 2014 “Shake it Up” Exterior Color Contest. Almost 1,000 votes were cast in the contest, with Brigitte Meehan's "Trapped in Cookie Cutter Land!" entry generating the most votes of the five finalists. In her contest entry, Brigitte explained how she wants to shake up and break the mold of being the "same as everyone else" in her 1,000+ home neighborhood. She detailed her dream for the home that would include colorful new exterior products and landscaping. “The judges saw the potential for dramatic change using color on the Meehan home exterior to get them out of Cookie Cutter Land,” says Wendy Bruch, marketing manager at DaVinci Roofscapes. “As a finalist, this home was evaluated by national color expert Kate Smith, who worked to create an artist’s rendering of what the home would look like transformed with colorful new products. "Kate specified a new Brownstone blend composite slate roof from DaVinci along with a Therma-Tru Classic-Craft® Canvas Collection® fiberglass door and sidelites painted Cochineal Red. As a final touch she recommended the addition of new low-maintenance porch columns and a balustrade system from Fypon. "Obviously the voting public saw the potential in adding 'top down' color to the home that will increase the overall curb appeal of the house and make it a stand-out in its neighborhood. For our 2014 contest, the Meehan home rose above more than 125 entries to capture the grand prize." When notified of her winning status, Brigitte was excited by the prize money that will allow her to add color and new products to the exterior of her home. "We're surprised, happy and excited, all rolled into one," says Meehan. "We love the rendering that the artist created that adds color and unique products to our home and can't wait to get started with the transformation!" See Inspiration from Colorful Contest Finalists and Judge Kate Presiding for more details on the contest!